LOGAN, Utah – Campbell Scientific, Inc., is pleased to announce that its IRGASON CO2 and H2O monitoring sensor has been granted U.S. Patent No. D680455. The innovative design of the IRGASON combines two sensors critical for accurate measurements of the movement and transport of CO2 and H2O between the Earth’s surface and the atmosphere. The two primary instruments necessary for these measurements are an infrared gas analyzer, or IRGA, to measure the amount of CO2 and H2O, and a sonic anemometer, which measures three-dimensional wind speed. In traditional systems, the IRGA and sonic anemometer are two separate sensors, and errors in measurement can arise from the separation of the sensors. 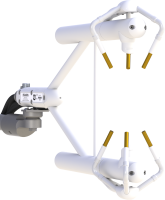 The IRGASON, in contrast, is the world’s first instrument that colocates the IRGA and the sonic anemometer in an integrated sensor that increases measurement accuracy and is simpler to install and maintain than earlier generation systems. With more user-friendly instrumentation and a less complex data evaluation method, the IRGASON provides climate scientists and land management agencies with better tools to accurately measure the surface-atmosphere exchange of CO2 and H2O. Understanding where CO2 is stored and how it is released is becoming increasingly important as scientists study carbon and water cycles, as well as the CO2 storage capacity of diverse habitats from urban environments to arctic landscapes. The information acquired from the IRGASON will help land management agencies make informed decisions regarding policies and protection of habitats on an international scale. The IRGASON sensor is one of dozens of sensors designed and manufactured by the Utah company that has been developing instrumentation for environmental monitoring for nearly 40 years. Campbell Scientific, Inc., is a worldwide manufacturer of dataloggers, data acquisition systems, and measurement and control products. Campbell Scientific’s mission is to satisfy the instrumentation needs of their customers by providing versatile and reliable products that can withstand harsh, remote environments. To learn more about Campbell Scientific, Inc., or to ask questions of the company’s highly trained technical and sales support team, please visit www.campbellsci.com.